As you prepare for an expedition, family camping trip or another type of outdoor activity, SCHEELS is at your side. 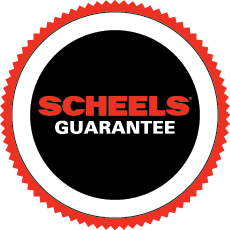 Since 1902, SCHEELS has offered great products, a wide product selection and world class customer service. With our same passion and values, we focused on offering top-of-the-line sporting goods in 1989. This has expanded into hard-wearing apparel, outdoor equipment and much more. Here you’ll discover featured products that are designed to be extremely durable and highly functional. They incorporate the latest materials and smartest design features for the best quality and performance available on the market today. Browse various products such as camping, premium water sports and summer apparel. There are multi-tools and survival products, backpacks, hydration products and cooking equipment. This 2-person tent features 30.5 sq ft of interior usable space, accommodating two adults. The Bear Creek is easy to set up and offers best-in-class waterproof coatings on the floor and fly. The included footprint not only offers an added layer of protection between the floor and the ground, but it can also be set up with the tent fly for the added versatility of a fast fly, lightweight set-up. Our Conifer 5+ tent is a basecamp style tent with unique attributes to make your next family camping outing a true success. This two-door outdoor hotel will comfortably sleep two adults, three kids and the family dog with ease. With an interior 6’2″ head height, and a whopping 84 sq ft of floor space, you’ll forget you even left home. Step out onto the front porch vestibule and set up those lawn chairs because you’ve got 33 sq ft to work with; kick back and enjoy. Add in the value of our removable gear loft, ample storage pockets and set-up instructions printed on the stuff sack and you’ve got a three season family tent that performs way beyond its price tag. When the trail is beckoning, you’ll be well prepared with the lightweight Cosmic down 40°F sleeping bag. Newly restyled for 2016 with 600-fill hydrophobic DriDown™, this bag ensures comfort in warmer weather adventures and dryness thanks to revolutionary down that resists water and condensation. The Cosmic down 20°F sleeping bag has been restyled and now features the exceptional warmth of 600-fill hydrophobic DriDown™ for higher performance. That means more moisture defense and quicker drying in the cold and wet. Versatile enough to use in three seasons, with great features like a thermal comfort hood and top draft collar, it’s a no-brainer for backpackers who love to be outside in rain, snow or shine. The Atmos AG™ 65 and the women’s specific Aura AG™ 50 introduces the Anti-Gravity™ suspension system to a new line of ventilated backpacks. This 3D suspension system contours your body providing seamless comfort allowing the user mobility with ease on any multi-day backpacking trip. Now, with your purchase of the SCHEELS Super Cooler, you are ready to escape to your favorite spot in the great outdoors, knowing your items will be kept colder longer. You own one of the most superior, roto-molded coolers available. The SCHEELS Super Cooler is built to last, whether traveling over the rugged trails, riding in the back of your truck or relaxing out in hot sun. This sturdy powder-coated steel frame can hold up to 300 pounds with a high back for ultimate comfort. Experience out-of-the-box comfort in this hiker. With durable synthetic leather, a supportive footbed, and Vibram® traction all in a versatile package, you won’t doubt why Moab stands for Mother-Of-All-Boots™. Experience the comfort, good looks and superb craftsmanship behind every pair of American-built KEEN shoes, boots and sandals. At SCHEELS, we carry KEEN footwear for active lifestyles in sizes and styles for men, women, girls and boys. We carry lace-up KEEN hiking boots, trail shoes and casual shoe styles to wear in the city or country. KEEN’s walking shoes are built with trademarked Cleansport NXT for natural odor control, a hydrophobic mesh lining and metatarsal ridge for underfoot support. Find durable, good-looking active wear in our Patagonia brand collection of apparel and accessories for adults and youth. We carry trucker hats, sweaters, hip packs, kids’ hats and mountain-worthy, trail proven Patagonia backpacks in our collection.